Please note you may be redirected to PayPal or a new tab will open showing items to your Shopping Cart. *Please note this item is a digital product and not a physical item. 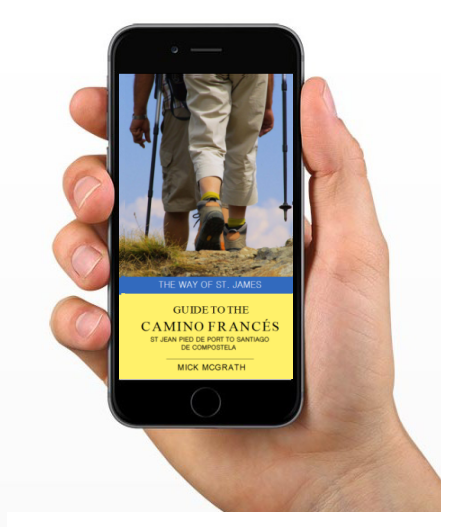 The Guide to the Camino Francés Second Edition eBook is the ideal item for pilgrims that prefer to have all their travel documents and books on their iPhone, iPad or Android device. The Guide to the Camino Francés eBook is formatted as an Adobe PDF Document. - Everything you need to know about planning for the Camino. - Details of accommodation options in each town and city along the way. - Daily overview to help you plan your route. - Colour contour maps of each stage. - Map icons with points of interest. - 50 full colour photographs of the Camino journey. - Spare pages at the end of stage, so you can enter your own diary notes. The Guide to the Camino Francés is designed for both the seasoned hiker or those just starting out. This 168 page digital eBook is the ideal travel companion and a 'must have' for the Camino De Santiago. As this item is a digital product, there are no refunds offered. Device/s shown in description images are not included. Click here to download a sample of the Guide to the Camino Francés. We accept payment via PayPal (VISA and Mastercard). Cost include free postage within Australia. For customers outside Australia, please contact us for postage charges. Digital products such as our eBook which have no national or international delivery charges. Items are normally shipped within 3 days of purchase. If you don't have a PayPal account, you can expect an additional 2 days for processing.